Gaajar ka Halwa, Carrot (Gaajar) Halwa or Carrot Pudding is a very popular dessert in India. There are loads of recipes you will find being using to whip this up. Some serve it warm, some serve it cold, some recipes will result in a richer version, but I'd like to think of mine as a slightly more health conscious variant which still results in a delightful dessert. This can also be kept in an airtight container in the refrigerator for a long time. But truth be told, it'll get gobbled up much sooner. In a heavy bottomed pan, heat the ghee. Add the grated carrots and stir well. Let the carrots sweat a little. Add the milk and let it cook off for a couple of minutes on a medium flame. Add the condensed milk. Stir well. After a few minutes add sugar to taste. Stir well. Leave it uncovered on a medium flame, stirring occasionally till all the liquid evaporates. You may need to turn the heat down towards the end of the cooking process. When its almost done, add the powdered cardamom seeds and slivered almonds. Mix well and take of the heat. Garnish with a few slivered almonds and serve. Once it has cooled completely, you can refrigerate the rest. Note: When adding the powdered cardamom and slivered almonds, you can also throw in a few raisins and/or some chopped pistachios if you want. Please spend some time and check out what the others have brought to the table this week. Thank you so much for coming and linking up this sweet treat. As I've said before, I love how you add your international flair to things and introduce me to new recipes. It sounds like a delicious combination, especially with that cardamom. Hope to see you again next week. Lisa, thanks for letting me be a part of this! I have been throwing carrots into everything. This is a good way to really use the carrots. It really is Bizzy B!!! Wow! I've never heard of this before. 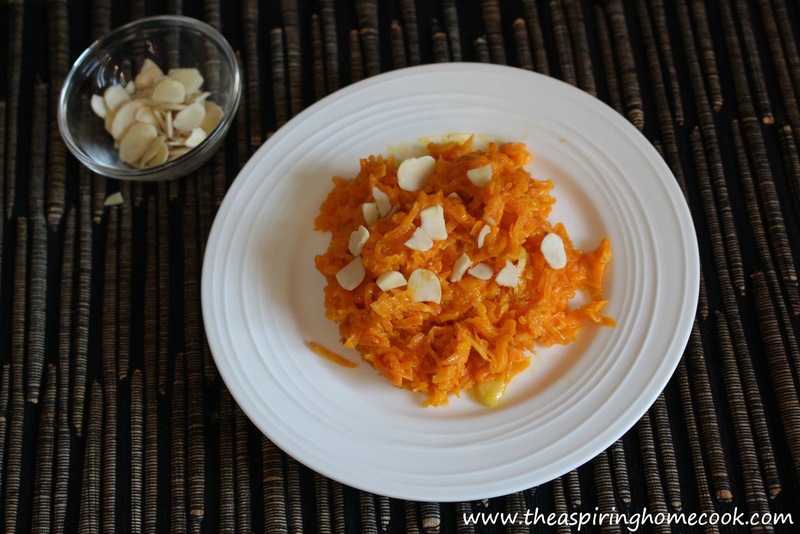 We make a carrot salad with raisins and pineapples but this sounds so sweet and creamy. I really want to try it. Mickey, this is really yum ... hope you can try it out sometime! I would love to make this. I like recipes where I can use vegetables in different ways to increase my vegetable intake. Thanks! Sportsgirl, let me know what u think of it once u've tried it!